The Alabama Wildlife Center is Alabama's oldest and largest wildlife rehabilitation and educational facility. Every year, almost 2,000 birds are brought to AWC ranging in size from Ruby-Throated Hummingbirds to Bald Eagles and everything in between. Through the AWC's "Raptors 101" program, you will learn about how these amazing predators fit in Alabama's ecosystems, what you can do to help protect them, and even meet live raptors up close! 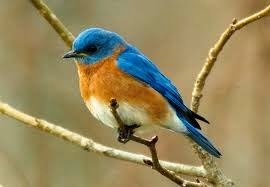 Eastern Bluebirds are lovely and beautiful. Patsy Scott coordinates the bluebird trail established long ago by John Findlay and she'll teach you everything you'll want to know about bluebirds. She'll even help you get started on your own trail! It's Party Time! Everyone who checked out books from the library during December and January is invited. We'll be eating cookies, playing games and doing a craft! So come join in the fun.